Drywall, made of gypsum, is used to shape interior walls in houses. When sanding drywall, a person may be exposed to particles containing gypsum, crystalline silica, or in some older ones, asbestos. These particles can be dangerous for the health. Drywallers are at a high risk of being exposed to the fine dust produced when sanding drywall or joint tape. However, anyone working nearby is also at risk of inhaling this dust. 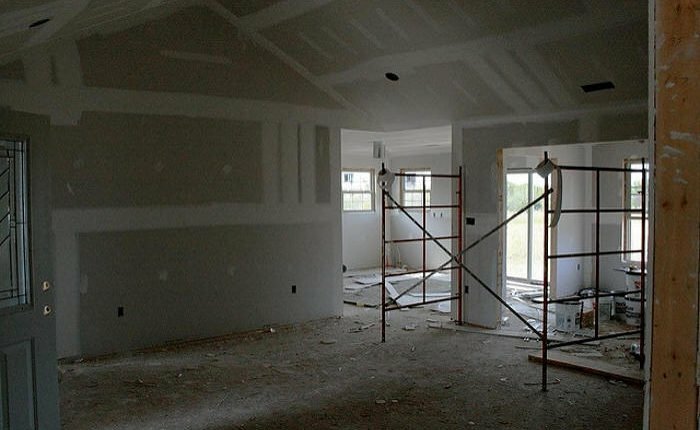 Drywall is safe to use as material for interior walls. The risks only arise when sanding drywall. The presence of dust and silica makes sanding hazardous. Inhaling this dust for a long period of time can lead to problems in the upper respiratory tract that resemble asthma. Inhaling silica can lead to silicosis and lung cancer. Though it’s not believed that these are being used in BC, people should still be made aware of drywall that came from China during 2001 to 2007. This drywall was found to have sulfur compounds which emit toxic gasses. Aside from causing complications in the upper respiratory tract, these can cause corrosion in electrical, plumbing, and HVAC components. Another risk to be aware of with drywall is the risk of sprains or strains when a worker has to move or lift heavy drywall panels. To best protect a worker from the hazards of sanding drywall, the dust created by the process must be controlled. Use a vacuum system to effectively lessen airborne dust when sanding and cleaning. Refrain from dry sweeping the area and using compressed air. If you suspect that asbestos is present in old gypsum boards – stay away from it and call a qualified asbestos abatement specialist to investigate and get rid of it. Continue reading to learn more about some other controls you can implement when working with drywall. The best way to limit the hazards of exposure is to fully eliminate its source by substituting a safer method or component. Is it possible to use a drywall mud free from silica? Reducing the risks of exposure is also possible by making physical alterations to the facilities, types of machinery, and methods used. Can improvements be made to the ventilation system? Is it possible to create a system that can capture dust during sanding and clean up? Can areas being sanded be blocked off? Because this is the least efficient among all controls, it must be paired with another control. Are workers always wearing proper protective equipment such as respirators and goggles? Is personal protective equipment maintained and working?